Posted on December 31, 2010 by M.E. Nous Sommes (which is French for “We Are”) is a jewelry brand from Paris, France that is lead by designers Kizda and Jeremy, and has gained much interest because of their collection of pendants that resemble the faces of celebrities in the fashion and music world. 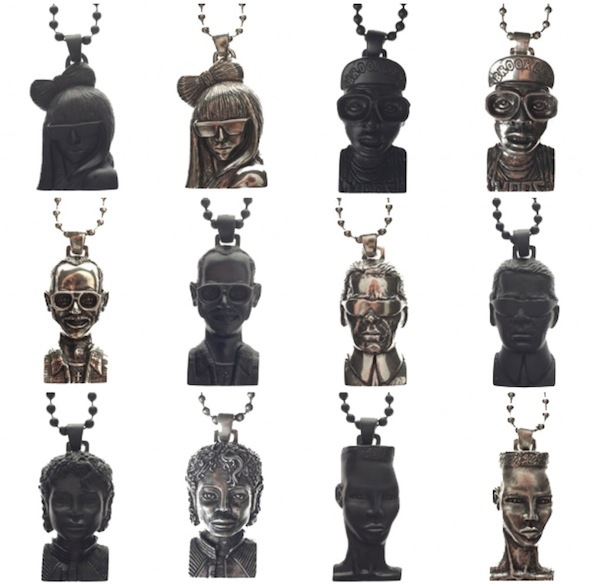 Inspired by the popular Jesus Piece, these pendants features celebrities such as Lady Gaga, Spike Lee, Terry Richardson, Chanel’s Karl Lagerfeld, Grace Jones, and Michael Jackson in gold, black, and old silver metal. They’ve already been embraced by many big names in the industry, and are price at (approx. $226-$292). Jennifer Hudson performed a rendition of “I’m Here”, with the Tennessee State University Choir, one of the songs from Oprah’s broadway play/movie, The Color Purple in tribute to Oprah Winfrey at the 33rd Annual Kennedy Center Honors ceremony. Although the award show was recorded earlier this month, it finally aired earlier this week. with the Tennessee State University Choir. Orginally, Fantasia sang the song as she wowed audiences as her portrayal of Celie in the play. Here she is at the 61st Tony Awards belting it out!! Personally, both ladies have powerful, soul envoked voices; however, Fantasia definitely adds that extra umph to it!! “Yesterday was an unfortunate lack in judgment sparked by public Twitter attacks from Raz B, who was bent on getting attention. Words cannot begin to express how sorry and frustrated I am over what transpired publicly on Twitter. “I have learned over the past few years to not condone or represent acts of violence against anyone. Molestation and victims of such acts are not to be taken lightly; and for my comments I apologize — from the bottom of my heart. That’s a wrap for the ultimate yacht getaway in St. Barts. At least for Kim Porter and the kiddies. After several days at sea in the French Caribbean, Kim and her twin daughters Jessie and D’Lila and son Christian and also Quincy were spotted packing up and loading up to head out. Seems like St. Barts is the A-list hotspot for the Holiday this year. Alicia Keys and Swizz Beatz were spotted holding hands and cuddling while out and about shopping last night. Nicki Minaj will be performing at Mansion in South Beach tonight for NYE. LeBron James just kicked off the LeBron “King” James Full Court Birthday Celebration which is a smart marketing scheme with an eleven-stop birthday tour where companies pay up to $500,000 to target their products and brand names to LeBron and his friends. Featured cities over the next four months are L.A., Chicago, Orlando and Atlanta. Dwyane Wade, Gabby Union, Kelly Rowland all came out to celebrate.